Robert Bray was born in Kalispell, Montana on October 23, 1917. He was a film and television actor probably best remembered for his role as the forest ranger Corey Stuart in the CBS series Lassie. Bray was born to homesteading parents who moved to Seattle, where Bray attended Lincoln High School. After graduation, he was a lumberjack, a cowboy, and a member of the Civilian Conservation Corps. In 1942, Bray joined the United States Marine Corps and saw action in the South Pacific during World War II. He finished the war at the rank of master sergeant. Bray entered film in 1946 under contract to RKO. He was marketed as the 'next Gary Cooper'. In the 1950s, the freelancing actor appeared in a varied number of roles including Carl the Bus Driver in Bus Stop with Marilyn Monroe in 1956 and as detective Mike Hammer in My Gun Is Quick in 1957. In the 1960-1961 television season, Bray played Simon Kane, along with Wayne Rogers and Richard Eyer, in the ABC series Stagecoach West. Bray and Rogers portrayed the co-owners of the Timberland Stage Line which carried passengers from Missouri to San Francisco during the 1860s. He starred between 1960 and 1963 in three episodes of NBC's Western Laramie. He appeared in three episodes of CBS's Perry Mason, including the 1963 segment in which he portrayed wealthy murder victim Martin Walden. He also guest starred on NBC's Temple Houston, Riverboat, and The Loretta Young Show. He appeared between 1958 and 1961 in four episodes of CBS's suspense series Alfred Hitchcock Presents. Other appearances were in ABC's Maverick and Sugarfoot, and NBC's Overland Trail. In 1958, Bray was offered a supporting role in South Pacific, but he decided to star in low-budget films. It was a strategic error in his career, for South Pacific became a smash success. 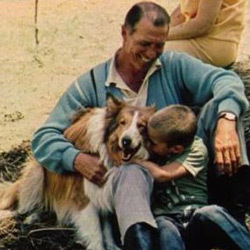 In 1964, Bray won the role of Corey Stuart in Lassie because of his liking for animals and their reciprocity toward him. Acting as Stuart, the storyline was that he acquired Lassie after the former owner, the Martins moved to Australia. Lassie's farm life then grew more exciting with rescues and adventures in the national forest setting. On three episodes, Bray appeared with the former child actor Bobby Diamond. However, Bray was replaced in 1968 by two younger rangers. The storyline attributes the end of Bray's role to injuries that the character sustained while fighting a forest fire. Bray and his wife, Joan retired to Bishop in the Sierra Nevada Mountains. He was often seen in his Winnebago in Bishop with his dog ‘Lady’. Bray was a fly fisherman, hunter, and model duck carver. He spent his last years in the High Sierras where he had made many of his early Western films. After his death of a heart attack, Bray's ashes were scattered over Zuma Beach in California, where he had spent lots of time as a young man. He appeared in 119 movies and TV shows.